When I went to San Francisco to attend the BlogHer Food Conference, I had great time enjoying what the local had to offer. My cousin sister made sure I tasted all the delicious treats the city had to offer. During our sightseeing tour we landed in Pier 39 and went through all those wonderful restaurants that offered California cuisine, and casual fare. We stopped at one of the restaurant that offered Pancakes and I immediately asked my BIL if he could click the process of making what we ordered. We ordered for a Nutella Banana Pancake with Whipped Cream topped with Icing Sugar. It was simply too delicious to explain. One of these days I am going to recreate the magic in my kitchen, meanwhile I will leave you to enjoy the Pictorial that we were able to capture. Hope you enjoyed as much as I had enjoyed eating and still remember the lingering taste! 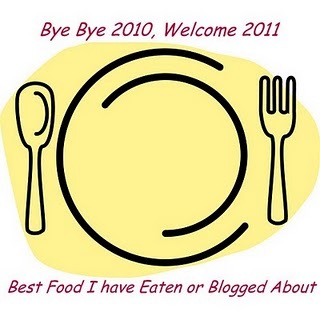 Sending this to Smitha who is celebrating her 1st Blog Anniversary. I am very happy and glad to send this as this pancake is something that really captivated me. Though it’s been nearly 3 months now, I can still remember the taste lingering! Nutella Banana Pancake will top the best food I have eaten during 2010 as it reminds me of my wonderful trip to SFA and the people of that city. Valli, superb pictorial. I think I will start liking bananas in pancake after seeing those drool worhty pics. And your description surely adds to it. Omg, that pancake with nutella and banana tempts me a lot..can feel how u would have enjoyed eating this yummy pancake.. Please I am drooling!Absolutely great! thanx for sending it to my event dear….Looking forward for ur mail! Crepes are similar to pancakes, but with a much thinner batter and they are quite simple to make in pretty much any frying pan. We have a local place called the Crepe Vine that makes both sweet and savory-filled crepes, the latter being more like crispy wrapped sandwiches. Hmm, looks very delicious. Lovely pictorial presentation. Lovely pictorial preparation of the pancakes!